Day 1 Yangon Arrival Welcome pickup and half day city tour to visit the magnificent Shwedagon Pagoda and Sule Pagoda..
Day 3 Golden Rock - Bago - Yangon Visit local markets and Shwe Maw Daw pagoda, the biggest and tallest Pagoda in Southern Myanmar..
Day 5 Bagan - Mount Popa-Bagan Drive to Mt. Popa, the extinguished million-year-old volcano. Also Popa is the abode of Myanmar Nats, the Spirits worshipped by some weak Buddhists. Day 6 Bagan-Mandalay-Amarapura-Mandalay Trip to U Bein Bridge believed to be the longest wooden bridge in the world that spans Taung Thaman Lake. Take a walk on the bridge and enjoy a photo opp..
Day 10 Inle Lake-Indein-Inle Lake Full-day Sight-seeings of Inle Lake, start with a morning 5-day traditional market at a village on the lake, then visit the Phaung Daw Oo pagoda which is the Holiest Religious Stupa ..
Day 11 Inle-Heho-Thandwe-Ngapali Beach Enjoy Ngapali Beach, the most beautiful beach in Myanmar. White Sand and Clear Water are the attributes of Ngapali..
Day 12/13 Ngapali Beach - Free and easy Free for beach and personal activities at one of the most beautiful beach of the World. Day 15 Yangon departure Yangon airport transfer for departure flight. 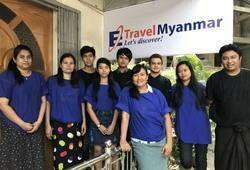 Arrive in Yangon where you will be welcomed by your local tour guide and transferred to your hotel to drop off you luggage. In the afternoon, a walk through "downtown" Yangon, a diverse mix of faded colonial architecture from the British times, and high-rises built by more recent investors; Sule Pagoda, built in the early 3rd century is a landmark in the city centre. Late afternoon visit the magnificent Shwedagon Pagoda of Rudyard Kipling fame and one of Myanmar's most sacred places. The massive bell shaped stupa is plated with gold and the tip of the stupa is set with diamonds and rubies, sapphires and topaz - a stunning sight as the sun sets and a most fitting place to begin our trip in this "Golden Land". Overnight in Yangon. After breakfast, drive to Kinpun Base Camp via Bago, approx; 4 hours. 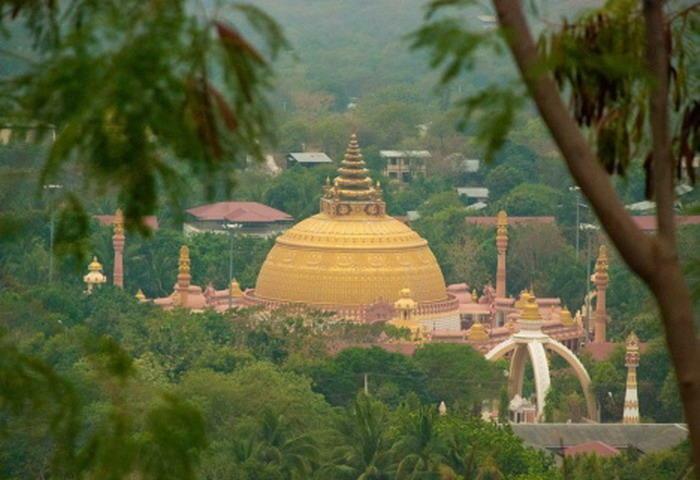 Bago was once the ancient Mon Kingdom as well as the seat of second Myanmar Dynasty. On the way, you can stop and visit Htauk Kyant Allied War Cemetery, the biggest war cemetery in the country maintained by the Commomwealth War Grave Commission. After Bago, you will reach Kyaik Hto, the junction town to go up the Golden Rock. Upon arrival at Kin Pun Base Camp, transfer by open-truck up to Hermit Hill. From there, walk about one hour to reach the Golden Rock. The trekking from Hermit Hill to the top is not very difficult cheering with Myanmar pilgrims on the way, encouraging each other. After check-in at the hotel, walk to Golden Rock. Enjoy the marvel of the situation of the Rock and view the evening activities of many Myanmar Buddhist pilgrims. After sunset on the Golden Rock, walk back to your hotel. After breakfast, walk down to Hermit Hill and by open truck transfer to Kin Pun Base Camp. From there, drive to Kyaik Hto. You can visit Kyaik Hto Morning market where you can see a lot of local foods, seasonal fruits and vegetables, fish and prawns. Walk around in the market and take pictures. Talk to the vendors who are very friendly and not accustomed to the visits of foreigners. Then, proceed to Bago. On the way you may stop from time to time to take the photo opportunities at some villages. Upon arrival at Bago, visit Shwe Maw Daw pagoda, the biggest and tallest Pagoda in Southern Myanmar, Bago Central Market, Shwe Thar Lyaung(Reclining Buddha) which dates back to centuries and which has the astounding history of its recovery from the bushes, and finally on the way to Yangon, visit the Kyaik Pun pagoda with four Giant Buddhas sitting in back-to-back position. Then drive on to Yangon. Upon arrival, transfer to your hotel for check-in. In the early morning, transfer to the Yangon airport for the flight to Bagan (Picnic breakfast can be arranged from your hotel!). Hundreds of Ancient Stupas, Temples, Monestaries, Libraries and Buddhist Universities welcome you to the then Heart of Buddhism. On arrival, drive to a temple to have a glimpse of Birdâ€™s eye view tasting a bit of its marvel. Then you may visit Nyaung U morning market which is known as Market On The Floor with a variety of local vegetables and products such as typical snacks, food, Handicrafts, Thanakha the most adorned Burmese Make-up, and so on. Then, visit the most sacred stupa Shwe Zi Gon built in 11 Century by the most outstanding Buddhist King, Anawrahta, Gu Byauk Gyi Temple to see the mural from 12 Century, the massive red-colored Htilominlo Temple, and lastly before check-in at the hotel, visit most beautiful Ananda Temple built in late 11 Century housing giant Standing Buddhas which give the viewers illusion of Smiling-or-Serious facial expression of the Enlightened One. In the afternoon, a visit to famous Lacquer Wares Workshop is worth enough to see its hand-made black products that come in a variety of household items from the smallest one of tea-cup to the Giant Sun Oak, the food container to be sent to the Buddhist monasteries in the yester years. Then, drive to the jetty of Mighty Ayeyawaddy river to enjoy sunset by boat. After breakfast, mount a bicycle touring around in the monument zone taking the snap-shots here and there among the ruined temples occasionally climbing some climbable pagodas to have the different panoramic views. Meet with local Sand Paintings sellers, Lacquered Items hawkers, etc and learn the local culture. In the afternoon, drive to Mt. Popa(approx) one and a half hour, the extinguished million-year-old volcano. 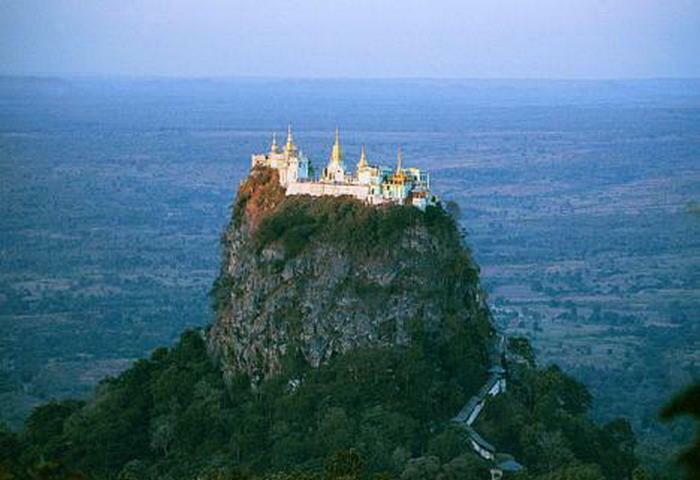 Also Popa is the abode of Myanmar Nats, the Spirits worshipped by some weak Buddhists. No wonder that the poor mind may seek the shelter under which one can feel certain of high-yield harvest, safe life. The name Popa represents the abundance of flowers and you can see seasonal flowers and fruits once you enter the small town at the foot of the extinct volcano. On the way to Mt. Popa, you may stop at a palm tree collection workshop to see the ways of living of AnyarThar people. Visit central Nat Shrine at the foothill of Mt. Popa. Going up 777 steps is optional but the view from the top makes tired-feet quite relaxing. Mount Popa houses not only Nats but also Asian monkeys along its steps uphill. Feeding the poor Gibson, Baboon costs not much money and you may gain some merits to add a step towards Nirvana. In the afternoon, drive back to Bagan. After breakfast, drive to Bagan(Nyaung U Airport) for the flight to Mandalay, the last Capital City of the 3rd Myanmar Dynasty. On arrival at Mandalay International Airport, drive to Amarapura aka the Southern City, the ancient Royal Capital before Mandalay. In Amarapura, visit one of the biggest monasteries with more than 1200 Buddhist monks where under the strict tight-scheduled Rules the monks study very hard the Buddhist Canons day and night in order to be able to carry on the Budda’s teachings verbally like the Noble Theras did after the Buddha’s demise in the 6th Century B.C. Then visit the Silk-Weaving workshop. Here, Amarapura hand-weaving silk Designs are very famous as Lun Yar Kyaw Cheik, More-than-hundred Loom Design, in which many small colorful silk thread looms wave through the weft creating the unique Myanmar Ceremonial silk longyis. Depending on the designs, to finish a longyi with a hundred or so looms, it can take at least a month! Then drive to U Bein Bridge believed to be the longest wooden bridge in the world that spans Taung Thaman Lake. Take a walk on the bridge and enjoy a photo opp! Then drive to Mandalay, upon arrival check-in at the hotel and take a rest for a while. In the afternoon, visit Kuthodaw Pagoda which is known as the world biggest book of the world, Golden Palace Monastery where you can see the best wood-carvings. The monastery was at first in the Palace City wall and 5 years before the British Annexation, it was dismantled and reassembled to the present site to be donated to the venerable monks. The Golden Palace so called because the interior and exterior surfaces of wood structure have been gilt with millions of Gold Leaves that are fabricated in Mandalay. 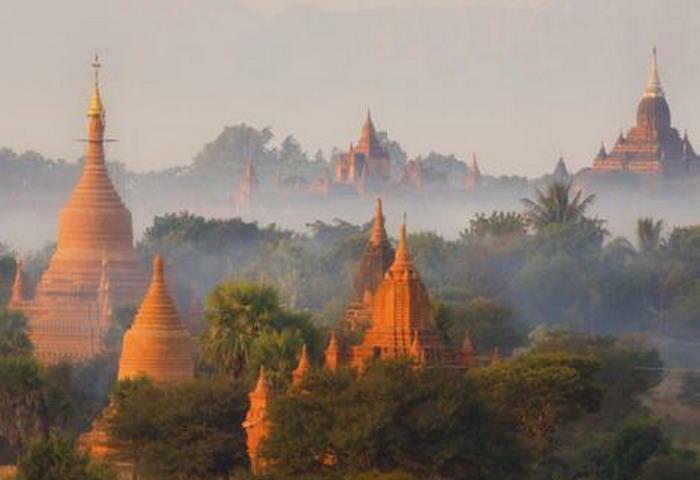 Finally, go up Mandalay Hill to enjoy the panoramic view of the city with sunset. After breakfast, drive to Kywe Sun Jetty on the western bank of River Ayeyawaddy. Walk a little along the bank for photos. Then, take a private boat to visit a small village of Mingun. Visit Migun Stupa unfinished due to the mysterious beliefs of its builder. Then, visit Mingun Bell weighing over 90 Metric Tons that is believed to be the world heaviest hanging bell in the world. Just in front is the very first Home for The Aged founded purely by a Burmese Lady. Meeting with the long-term nurse who speaks fair English at the Center of Old Age pays a lot. Finally visit Mya Thein Dan Pagoda which represents famous Mt. Meru according to Buddhist Cosmology. Getting on Mingun Taxis, that is, the Oxen-drawn Carts makes a visit to Minguy memorable! After that, take the boat back to Mandalay. 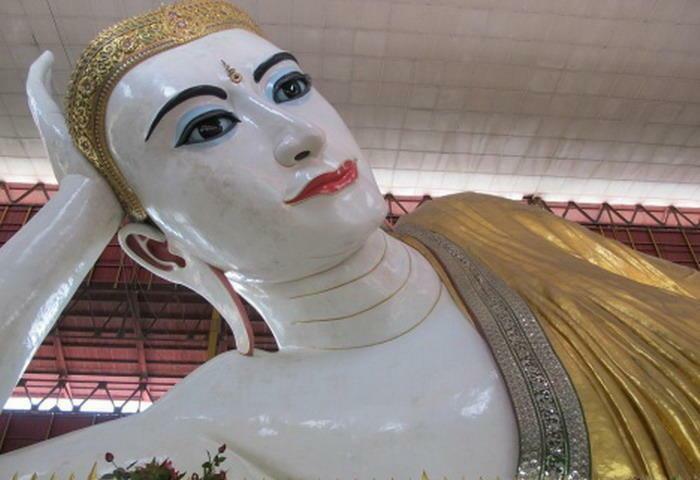 In the afternoon, visit Mahamuni Buddha Image situated on the outskirts of Mandalay City highly venerated and adored by Mandalay Citizens. The Image is believed to have been here from Arakan State, another Kingdom in 18th Century situated at Western Coastal Line as a war trophy. As if all the gold leaves beaten in Mandalay came upon the image, Gold leaves offered by the worshippers form the lumps on the robe of Buddha. Then visit the Handicrafts Workshops such as Gold Leaf Beating, Stone Carvings, Bronze Casting, Marionette and Wood Carvings and so on. Mandalay having built as new Royal Capital City, the king gave plots for the Arts and Craftsmanship around the Palace City and so Mandalay has become the center of all of Myanmar Traditional Handicrafts. After breakfast, transfer to Mandalay International Airport for the flight to Heho, Shan State. Upon arrival at Heho airport, drive to Kalaw (approx 1 and a hlaf) on the way stop at Aung Ban, stop at a local Market selling typical foods, wines, traditional handcrafts, and you may try Shan Noodles there at one of Myanmar Traditional Teashops. Besides those items, the small street market has Myanmar Orchids Selling stalls and fruits. Shan Dried Tea there is the best of Myanmar. Then, continue to Kalaw, a British Hill Station, a small town with ethnic minorities, such as Pa-O, Palaung, besides the Shan People. In the town, you can still feel the colonial atmosphere with the colonial buildings and the houses with the chimney indicate the weather of the lovely town which is over 1300 meters above sea-level. After check-in at the hotel, in the afternoon drive to the west of the town where you start your half-day Trekking to Palaung village of Pain Hgne Pin. Before, this tribal minority used to live in Wooden long houses for a big family. And now with the growing wealth on farming they demolished their typical long houses and use cement and Adobe bricks to construct the houses and for the roofing, corrugated iron instead of thatch grass. Visit a household in the village and your local trekking guide will introduce you to the tribe. In the afternoon, walk back to another meeting point where you will see your car and then transfer back to your hotel. After breakfast, drive to Pindaya(approx; 2 hours), a small peaceful town situated at the base of Shan Mountains and the end of very fertail plains. On the way to Pindaya from Aung Ban is really picturesque and you can make many stops for photographing and introducing to the local farmers working in their fields cultivating a variety of crops such as Sesame, Cabbage, Coliflower, Mustard Oil, Wheat and so on besides the perennial orchards like Mandarin Oranges and Tea. Upon arrival visit Paper Umbrella Cottage industry where you can see the Shan Paper production, Process of Umbrella Making only by hands. Then, drive up to Pindaya Lime-stone Natural Caves with more than 8000 Buddha Images. Get lost yourself in the cave taking pictures of most beautiful Shan Style Buddhas. In the afternoon, drive to Nyaung Shwe (approx; 3 hours) another Shan town bordering famous Inle Lake on the northern end. On the way, you can visit Shwe Yan Pyay monastery built mainly of teak wood in 1882 and it’s pagoda with colorful mosaics decorated on the interior walls around the central pagoda constructed 2 years before its adjacent monastery. 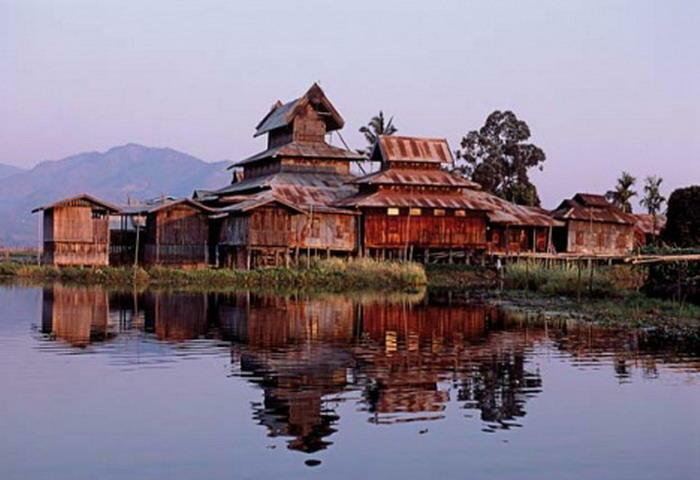 Then continue to Nyaung Shwe where you embark on the long boat to reach your hotel at Inle Lake. Full-day Sight-seeings of Inle Lake, start with a morning 5-day traditional market at a village on the lake or on the shore of the lake. 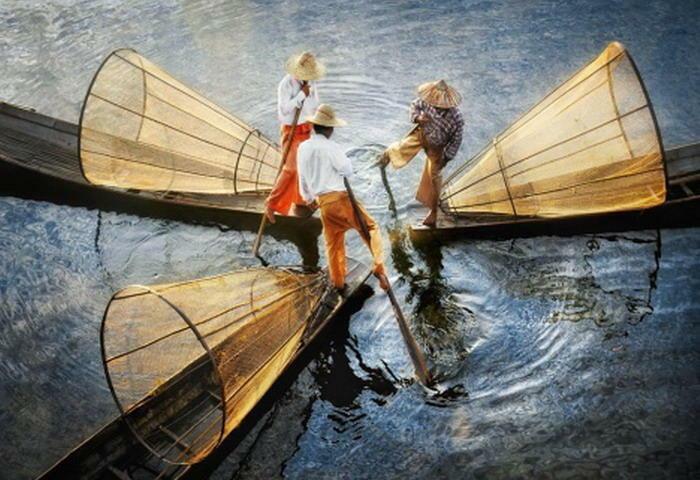 Here at Inle Lake, the markets come on 5-day basis. Besides the Inthars, some tribal ladies such as Pa-O, Pa Laung can also be seen at the market selling their farm produce and afterwards they go back to their villages on the mountain with the purchase of what they need for the household. The market is a photo opportunity for you. Then visit the Phaung Daw Oo pagoda which is the Holiest Religious Stupa housing 5 buddha images, Silk Weaving village (lotus fabrics weaving technique can also be seen unique only in here! ), Blacksmith, Cheroot or Myanmar Cigar factory, the nature of Inthars, Lake Residents with their Floating Gardens and finally visit the Jumping Cat monastery which is the oldest one with antique Shan-style Buddhas and Buddhas’ alters. Enjoy the cat show at the monastery. In the afternoon, continue by boat to Indein Ruined Pagoda Complex along a small river that sustains Inle Lake by flowing into it. Passing the Large green Myanmar Bamboo forests on the way, you will reach the Ruined Indein pagodas that stand on the hill slope providing a panoramic view to the lake. After breakfast, transfer by boat to Nyaung Shwe. Then from there by car to Heho airport for the flight to Thandwe airport, at Ngapali Beach, the most beautiful beach in Myanmar. White Sand and Clear Water are the attributes of Ngapali in addition to the fresh sea-foods and little amount of Tourist Visit compare to the other beaches in South East Asia. Ngapali beach is believed to be discovered firstly by the Italians who worked for the British Government during the colonial era and the beach seemed to them so fascinating that they gave the name, Napoli, and the time passed and now it is called Ngapali. Enjoy the first-day sunset at the beach. You are free for personal activities here. You can relax at the beach enjoying the sea-foods to your heart content or grasp a bicycle to explore nearby fishing villages along the motorway to a little far end of the beach line introducing you yourself to the very friendly natives. Sometimes, you may enjoy Serendipity such as taking part in pulling the fishing nets together with the cheerful fishermen, seeing how they prepare in the process of drying fish, and so on! Your hotel can arrange short-time boat trip to nearby lonely island visit. A-few-hour Snorkelling Trips can be arranged with your hotel for those who like to have a look at the sea creatures and underwater weeds at the nearby lagoons. End of Leisure at the beach. After breakfast, the car from your hotel will transfer you back to the Thandwe Airport for the flight back to Yangon. If the time permits, you can visit National Museum with the last Royal Lion Throne which was sent back by Lord Mt. Batten after Myanmar got her independence from British Imperialist in the year 1948, the Royal Regalia, Paintings of the best Artists from pre and post-independence era.